Today I received a lovely email from one of my readers and twitter followers, @Hel_Mc, about some of the Leicesterisms she was told as a child. After I posted about Black Annis, somebody tweeted me and said how the story scared her as a child, but @Hel_Mc hadn't heard of it - it was the nine o'clock horses she was threatened with. "A saying which completely confused me as a kid was "its a bit black over bills mothers". On being told this, i would immediately run to the front window looking out in panic. Why? Well my dad's name is Bill and his mum lived opposite our house!!! Of course i know what it means now, but when i was little i expected to see dark things hovering over my gran's house!!" "Sometimes if dad went out & I asked where he was going his response was "Huncote on a pig". No idea where that one comes from though." 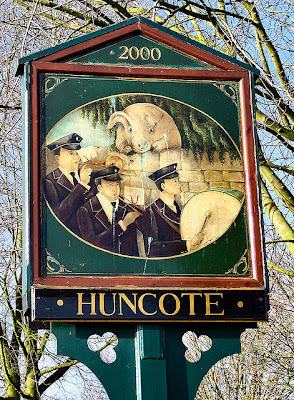 I've never heard of the 'Huncote on a pig' saying, and I thought I knew almost everything about Leicestershire history! From the research I've conducted, it seems that the phrase comes from the fact that the locals of Huncote once put a pig on a wall as they watched a marching band go past to celebrate the yearly feast. Apparently the pig looked on in trepidation as the locals from Huncote would later slaughter that same pig for the feast! I've also been told that the Huncote village sign carries a picture of none other than a pig on a wall! Thanks @Hel_Mc for your email. Do you know any interesting local Leicestershire phrases? Please comment below, tweet me on @thiswasleics or email thiswasleicestershire@gmail.com and I'll do some research into it. "Black over Bill's mother's" is one of those phrases that people all over the country claim is local to them - it may have originated in the East Midlands, but then again I've heard confident statements that it's from the Black Country (and it was something my Brummie relatives said), and it seems pretty widespread. Regarding Huncote, I've heard it as "going to Huncote to buy a pig", and it usually means the same as "going to see a man about a dog", i.e. "mind your own business about where I'm going". If she was hot my mother used to say that she was "Sweating brass medals". No idea where that comes from though.